THE COMPANY HAD 960 EMPLOYEES. Before September 11, 2001, the successful Wall Street firm Cantor Fitzgerald was virtually unknown to the country at large. But after the terrorist attack on New York City, the company became the symbol of the magnitude of the loss suffered on that terrible day. The real story of Cantor Fitzgerald, both before and after 9/11, is told in Danielle Gardner's powerful, eye-opening documentary Out of the Clear Blue Sky . The film, a 2013 Asphalt Films theatrical release, comes to DVD and Digital Download on September 2, 2014, from Virgil Films. Out of the Clear Blue Sky tells the riveting, behind-the-scenes story of Cantor Fitzgerald, which was headquartered on floors 101 to 105 of One World Trade Center in Lower Manhattan. On September 11, 2001, when hijackers flew commercial airliners into the Twin Towers, 658 of Cantor's 960 employees died, amounting to nearly one-quarter of all people killed at the site in the worst terrorist attack in American history. Overnight, Cantor became world famous for the worst of all possible reasons. Cantor Fitzgerald CEO Howard Lutnick was taking his son to his first day of kindergarten when the first plane hit the North Tower - just below his company's offices. On September 13, Lutnick's emotionally raw, tear-filled interviews transfixed the nation. His distraught television appearances struck a deep personal chord with millions of traumatized Americans reeling and shell-shocked by the unprecedented attacks. But, within a week, Lutnick stopped the paychecks of his missing employees. It was an act praised by some - as a necessary step to save the company and to help the victims' survivors - but lambasted by more, as a self-serving, heartless betrayal by a man well known for his ruthlessness. Lutnick's prior reputation as cutthroat - even by Wall Street standards - preceded him. The media turned on him and Lutnick went from the sympathetic face of the tragedy to vilified pariah overnight. Then he completely withdrew from the public eye. Although Cantor suffered almost twice the casualties of the FDNY, the company's story soon faded away. 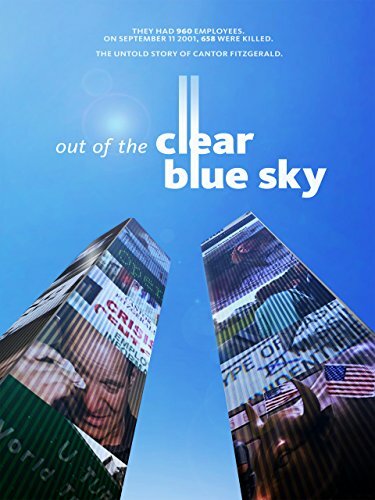 Directed by an award-winning filmmaker and September 11th family member, Out of the Clear Blue Sky tells twin stories: the saga of the ravaged business and surviving employees, and an insider's take on the unusual community of families that formed in the aftermath. Cantor's loss created the largest single group of 9/11 mourners, more than 6,000 people bound by their horrific common experience. There wasn't just one memorial to attend; there were 10 a day for over two months, forcing people to choose whose funeral to go to. A true stranger-than-fiction account, from the jittery and stunned first days - a time unlike any other in American memory - and unfolding over months and years, this powerful and important film captures what it's like being caught in the cross hairs of history. Daphne Howland of The Village Voice said, "What this movie shares is of great consequence, a moving and unlikely story...about a tragic and unlikely event." The New York Times' Jeannette Catsoulis called it an "eloquent insider documentary." "Enough twists and turns to fuel a miniseries...compelling and complex" touts Frank Scheck of the Hollywood Reporter. Joe Neumaier of the New York Daily News said it "has hidden drama, heartbreak and renewal." "A Tolstoyan reminder that all tragedies are unique," praised Chris Barsanti of Film Journal International. Out of the Clear Blue Sky is produced by Asphalt Films. About Virgil Films - Virgil Films & Entertainment was founded in 2003 by Joe Amodei to acquire, market and distribute DVD, TV and Digital product in the theatrical feature film, documentaries, special interest and sports categories. The company has built partnerships with OWN, Sundance Channel Home Entertainment, National Geographic Cinema Ventures, ESPN, MLB Productions, Morgan Spurlock's Warrior Poets and other high-profile entertainment brands since their inception. Recent releases from Virgil Films & Entertainment include the documentary Miss Representation; Todd Solondz's Dark Horse, the critically acclaimed documentary Bridegroom, the timeless Forks Over Knives, and the Oscar(R) nominated documentary Restrepo. They have also released the compelling Gunhill Road, The House I Live In, Paul Williams: Still Alive and others.Follow us on twitter: @virgilfilms | www.VirgilFilmsEnt.com.